The story of Marco Polo's famous adventures now in Spanish More than seven hundred years ago, Marco Polo traveled from the medieval city of Venice to the fabled kingdom of the great Kublai Khan, seeing new sights and riches that no Westerner had ever before witnessed. 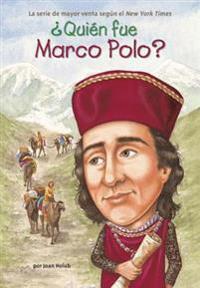 But did Marco Polo experience the things he wrote about? Young readers are presented with the facts in this entertaining, highly readable Quien fue . . . ? biography. Over one hundred black-and-white illustrations bring Marco Polo's story to life.